CARIBOU — The Executive Board of Northern Maine Development Commission (NMDC) has given the green light to two projects seeking funding, one which looks to reduce food waste in the region and another that would identify a federally designated bicycle route from Bangor to the St. John Valley. Meeting Thursday, Dec. 8 in Caribou, the board approved a solid waste management grant proposal for $86,000 to the U.S. Department of Agriculture Rural Development. In fact, roughly 50 percent of all produce in the United States is thrown away—some 60 million tons (or $160 billion) worth of produce annually, an amount constituting one third of all foodstuffs. Wasted food is also the single biggest occupant in American landfills, the Environmental Protection Agency has found. Another component of the project would be to create an online backyard composting training program. Kamm indicated that previous NMDC composting classes were popular in the region and by incorporating online training more people could take part. He said if participants successfully finish the online training they would be able to print out a certificate for a free backyard composter, while supplies last. Kamm also presented the board on another potential project, which would identify a federally designated bicycle route in Aroostook and Penobscot counties. “We [NMDC] have been asked to submit an application for the planning involved in designating the bike route,” said Kamm. The Maine Department of Transportation is proposing a $100,000 contract for a two-year project beginning in early 2017. NMDC would be responsible for identifying the region’s assets and potential routes, develop a stakeholder group, facilitate the conversation with municipalities on where the route should be located, work to link nearby communities to the proposed U.S. Bike Route and develop and submit the federal application. Also at the meeting the board received the final report on a recently completed Rural Business Development Grant project which looked at agriculture distribution opportunities for Aroostook, Washington and Piscataquis counties. Some of the recommendations from the findings include encouraging further development of food value chain networks, promotion of food hubs and distribution nodes by providing technical assistance, continue to facilitate meetings between local institutions, wholesalers and growers to expand markets and opportunities and expand lending programs to assist producers. Also as part of the project the Maine Food Atlas was populated with producers from Aroostook, Washington and Piscataquis counties. The Maine Food Atlas is a local food asset mapping project, which provides essential baseline information necessary for rebuilding community food systems, assuring greater food security for all, and improving the social, economic, environmental, and health impacts of our food. The next Executive Board meeting is scheduled for Feb. 9 at NMDC in Caribou at 12:30 p.m. There have been twenty crashes on this link of Route 167 in Fort Fairfield, where blowing snow and unsafe speed account for most of the crashes. 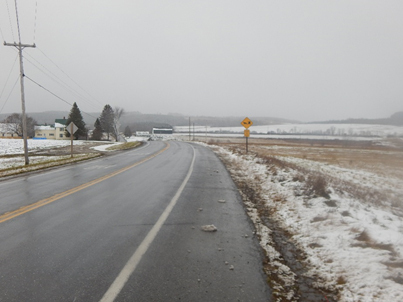 Through a contract with the Maine Department of Transportation (MaineDOT), Northern Maine Development Commission (NMDC) staff has performed preliminary safety assessments of high crash nodes (intersections) and high crash links (segments of highway between intersections) in Aroostook County. These assessments were developed into a report that was shared with the MaineDOT Region 5 Office, MaineDOT Bureau of Planning, and the local towns in which the high locations are located. Recommendations in the report offer low cost, short-term remedies for making high crash locations safer. High crash locations (HCLs) were identified by the MaineDOT as being locations with eight (8) or more crashes and exceed the Critical Rate Factor (CRF) of 1.00 or greater within a three-year period. A highway location with a CRF greater than 1.00 has a frequency of crashes that is greater than the statewide average for similar locations. A CRF is a statistical measure to determine the “expected crash rate” as compared to similar intersections in the State of Maine. In this regard, the analysis considers both the number of crashes and exposure over a three-year period. · Making sure locations were not already being addressed by the MaineDOT Region 5 Office or the MaineDOT Bureau of Planning. · Consider installing solar powered signs to help keep driver attention. To view the 2016 NMDC Christmas Card, click on ornament above. AROOSTOOK COUNTY — The Aroostook County Tourism (ACT) board is leveraging social media to attract tourists to the region, most recently through a “Home for the Holidays” campaign. Earlier this month ACT, with assistance from marketing company Sutherland Weston, conducted a contest utilizing social media, primarily Facebook, to make folks aware of tourism opportunities in Aroostook. Web surfers were directed to fill out an entry form on www.visitaroostook.com for a prize package worth more than $800. An additional entry was possible by liking and sharing posts on the ACT Facebook page. Prizes were donated by many Aroostook County businesses and organizations, including the Aroostook Hospitality Inn, Bouchard Family Farms, Central Aroostook Chamber of Commerce, Century Theater in Fort Kent, Echoes Magazine, Fort Kent Outdoor Center, Hampton Inn, Lakeview Restaurant, Lonesome Pine Ski Trails, Maine Potato Board, Mike and Son’s-St. John Valley Rental, Northern Door Inn, Presque Isle Historical Society, Riverside Inn Restaurant and Teresa’s Corner Café and Bakery. According to analytics from Facebook, more than 60-thousand people were reached with information about the “Home for the Holidays” giveaway. “Sutherland Weston is pleased to have supported such a successful community event and look forward to a great winter season as we continue to help engage people in all the great things that Aroostook County has to offer,” said Sutherland Weston account manager Danielle Harrington. “Aroostook County can easily boast its many tourism attributes, and should. What impresses me most however; having only been a part of the Aroostook County Tourism marketing initiative, is the spirit of cooperation and support we get from the business community and the dedicated members of the ACT Board”, said Alain Ouellette, coordinator for ACT. The winner of the contest was Marcia Parlin Bell. ACT, an affiliate organization of Northern Maine Development Commission, is dedicated to improving the economy of northern Maine through its tourism efforts. Working under the brand Aroostook “the Crown of Maine”, ACT promotes some of the region’s greatest assets like its pristine beauty, diverse culture, storied history and warm, hospitable people to potential visitors from around the world. Funding for ACT is provided in part through a grant from the Maine Office of Tourism. The Business Finance Division of NMDC completed loans with three clients in November. Marc Cyr is purchasing a company that distributes Canadian candy to local stores in Maine and the requested funds will be used as working capital and to purchase his first round of inventory. He is located in Madawaska and serves customers based in the St. John Valley and parts of central Aroostook County. NWTP Corp, known as North Woods Trading Post in Millinocket, is owned by Sandra and Thomas Bell. These funds provided the Bells with working capital and inventory while they work on a larger project to restructure their debt. Bacon Auto & Truck, Inc has been operating in Caribou for 16 years and is using this funding to expand its used auto sales business into Presque Isle while adding aftermarket automobile accessory sales, service, and installation, as well as automobile detailing.